I've added the minis and all the centers. My scrappy Dresden is now a flimsy. Next step, figure out a back and how to quilt it. I'll save that for another day. This week I'm off on a quilting adventure to Bryce; lots of friends, food and fun fabric all rolled together in a great quilting retreat. I'm looking forward to teaching a couple of classes and also taking one, a scrap mystery. I've never done a mystery before. The fact that this one was scrappy made me brave enough to try. My scraps always play so nice together. I know whatever happens I'll like it. Now it's your turn. What have you moved forward this week? Link up and let us see. Simply stunning! 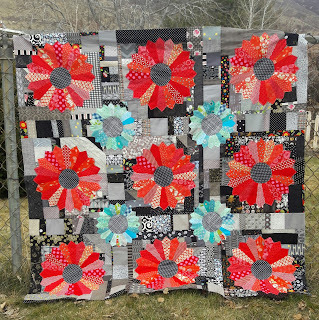 I love those scrappy reds and teals with the black and white. Gorgeous. I'm afraid I haven't moved much forward this week! That is just beautiful! Ilove your colors!! Love that top! Very bright and cheerful! I am not going to Bryce this year, maybe next year. Always a fun time! what a great top and such cheerful colors. Have a wonderful retreat! It is really beautiful. Have fun at your retreat. I'm looking forward to seeing what your mystery is. So I have a silly question--do you cut away the top behind the Dresdens after they're stitched onto the the top, or do you just leave it as is? 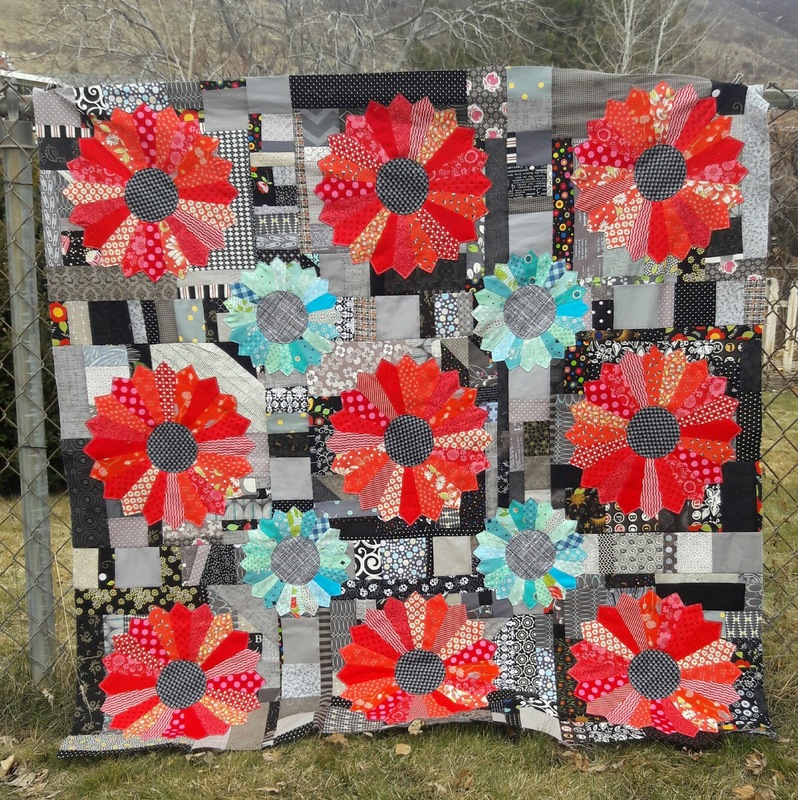 What a stunning quilt this will be! Pretty Dresdens! Those reds play so nice together! I think it's wonderful how the reds pop on the black, but then your eye sees the paler blue. This quilt top has a lot of sparkle from those little touches of blue. good choice! Somehow, I just discovered Moving It Forward Monday! Are there rules or is it a Linky Party? Just asking? I seem to make lots of forward progress some weeks, but not so much finishes! Maybe too many projects going at once? Couldn't be!!!! !